Step Two Scroll down on this here blog entry page to where it says "Room List"
Step Three: Highlight the entire list. Cut it. Paste it in the upper box here. Step Five: Season to taste. You can and totally should save the whole list as a text file and add your own rooms over time, steal ones you like anywhere you find them, and cut out ones you think are lame--just remember to keep the descriptions one line long or less or the program won't work. Also remember since there's already a map you don't need descriptions of the dimensions of the rooms themselves or doors. If you want certain kinds of monsters in the dungeon, go here, post the room list in one box, put a list the monsters you want to use in one of the other boxes (Object Input 1 or Object Input 2) and a few blank lines and it will create a new list below which has ever possible combination of room and monster, plus some empty rooms. Then you can cut that list and go back up to Step Three: now the dungeon is all about whatever monsters you wanted to use. 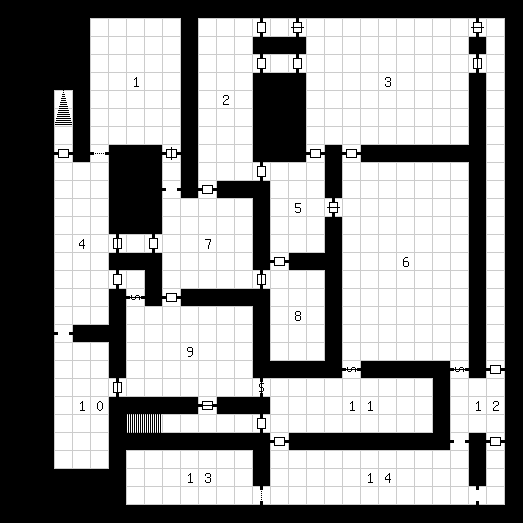 This list of 1000 ish rooms below was generated collaboratively on Google Plus here and here. I removed some of the stupid ones from the master list, feel free to put them back. Black crown, comprehend fungi save v madness. Down-sloping rough spiral. Bottom: throne, yellow robes. The ceiling is covered in black cones. DriveThruRPG has a free utility called "Inspiration Pad" for download. It can do this kind of text picking as well. I am editing the room list to run on it now. Good stuff! Wow, this is great! Thanks, Zak. Thank you Zak. This rocks.